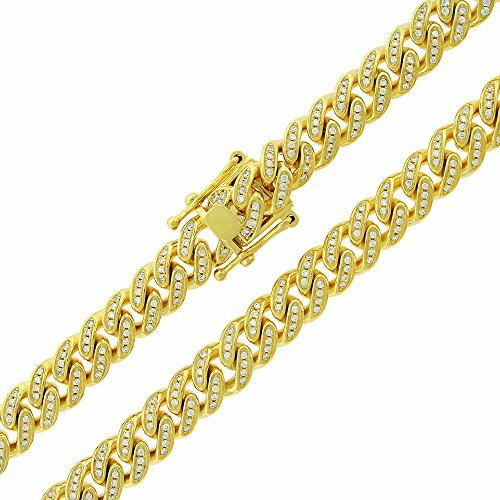 CHAIN INFO: 8.5mm wide, Sizes 28" & 30". Weighs 3.7 grams per inch. Crafted from premium .925 sterling silver with yellow gold plating. Box lock closure. Jewelry Box Included. ICED OUT: Each Miami Cuban link is encrusted with shimmering cubic zirconia stones that adds a brilliant & everlasting shine! AUTHENTIC - All ISD sterling silver products are stamped with the hallmark that denotes .925 pure sterling silver. 100% SATISFACTION GUARANTEE! - We want our customers to be completely happy and confident with their purchase. If for any reason you've changed your mind or there is a problem, simply contact us and we'll make it right. That simple.